Our activities focus on the interaction of laser light with matter for spectroscopic applications as well as the fabrication of nanomaterials, optoelectronic devices, and sensors. We have developed pulsed-laser deposition (PLD) and laser-induced plasma spectroscopy (LIPS) techniques, for specific applications in materials preparation and diagnostics. Advancements developed at TPCI include the faster and cost-effective production of multi-layered thin film structures with tailored properties, suitable for the optoelectronics industry. Similarly, the sensitivity for elemental chemical analysis was improved to meet the demands of environmental applications. We have developed a new variation of PLD, where we use two synchronized lasers to simultaneously ablate two different target materials. This way we can achieve the deposition of thin films (ZnO, NiO, TiO2, SnO2, etc.) that contain nanoparticles from the second target material, in the bulk or on the surface. The presence of nanoparticles affects the properties of the films in a controlled fashion, paving the way for new applications with improved performance. 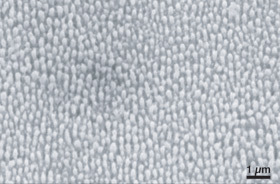 One application of the dual-laser PLD method is the deposition of thin NiO films with embedded Au nanoparticles. These films operate as low-temperature, high-sensitivity, electrochemical gas sensors. 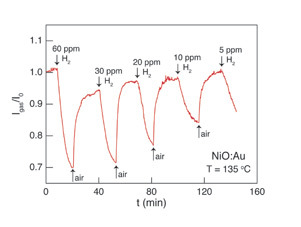 The Au nanoparticles act both as nanoelectrodes between the NiO grains and as catalysts, lowering the film resistivity dramatically and enhancing the reaction with hydrogen. We were able to detect 5 ppm of hydrogen with a NiO:Au sensor operating at 135 C, which is at the lower end of the state of the art. Irradiation of silicon with a large number of laser pulses in SF6 gas or water, creates quasi-periodic micrometric or nanometric spikes on the surface of the material, depending on the irradiation conditions and the surrounding medium. Due to the unique electrical, optical, and structural properties of the laser-processed areas, microstructured and nanostructured silicon finds applications in the fabrication of broadband photodiodes and thin-film solar cells, as well as in SERS spectroscopy. Employing pulsed laser deposition we work on the fabrication of thin-film solar cells with increased efficiency and reduced cost. For improved efficiency, the interface of the photoactive layer with the front and back electrodes will be partially covered with a dense array of metallic nanoparticles (Au or Ag). These nanoparticles provide efficient coupling and trapping of the incoming light via broad-angle scattering and enhancement of the local electromagnetic field through excitation of surface plasmon resonances. For reduced cost, indium tin oxide (ITO) which usually serves as the transparent electrode, will be replaced by the more cost-effective and non-toxic ZnO. Thin-film solar cells may be used as clean electricity sources in solar panels connected to power grids or applications such as consumer electronics and smart fabrics.